Apple’s iPhone presentations are traditionally somewhat conflicted events—are they for average users or just developers? 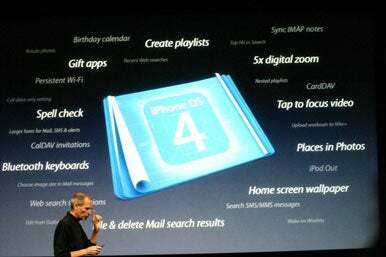 Going by the features the company showed off on Thursday, iPhone 4.0’s disclosed changes appeal mainly to consumers. Unlike 2009’s iPhone 3.0 event, where Apple spent a lot of time talking about developer features, Thursday’s edition seemed to gloss over them for the most part, though two of the most interesting additions—multitasking and the introduction of iAd—could mean a lot for application makers. Developers I spoke to were generally positive about the additions—especially when looking at it from the perspective of users of the devices. Two, two, two tasks in one! There’s no question that multitasking was the star pony of Thursday’s show, as Apple trotted it out in extensive detail, running down seven frameworks that would let developers carry out certain processes in the background. And for both developers and consumers, it’s a welcome addition. Arment is one of those who may be left out in the cold: “Unfortunately, the announced options for background functionality don’t provide a way for me to periodically download Instapaper customers’ newest saved articles without the app running.” Still, he added that he’s glad the feature will be there, even if he has no immediate plans to use it. Developers seem tentatively excited about the possibilities of iAd, though they remain curious about many of the details that Apple has not disclosed. “The biggest question is how Apple is going to manage iAd,” says App Cubby’s Barnard. “It just doesn’t make any sense for advertisers to pay the same rate for ads in a New York Times app as they would for a sub-par tic-tac-toe game.” That’s been the problem for other companies such as mobile advertising powerhouse (and recent Google acquisition) AdMob, he says. Hockenberry says the Iconfactory—which currently serves ads in its free version of Twitterrific—will keep a close eye on how iAd shakes out. But Arment doesn’t think Apple getting into the ad game will mean the end of smaller, premium advertising networks such as The Deck. “That’s not what Apple was targeting,” he said. While we users have to wait until summer for iPhone 4.0 to arrive, developers have the added benefit of getting to play with the beta versions now, which means they can start implementing 4.0-specific features to wow all us later this year. And while most of them had only just started delving into the SDK when I spoke with them, they all seemed to have high praise for the latest version of Apple’s mobile operating system.